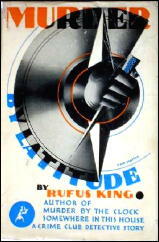 » A 1001 MIDNIGHTS review: RUFUS KING – Murder by Latitude. A 1001 MIDNIGHTS review: RUFUS KING – Murder by Latitude. Rufus King’s sole series character was a New York police detective, Lieutenant Valcour. A proper gentleman detective, Valcour’ s only unusual characteristic is that he is a French Canadian. 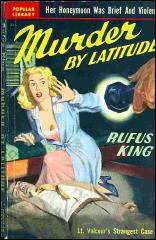 Murder by Latitude is one of Valcour’ s more exotic cases. The Eastern Bay is a cheap passenger-carrying freighter making a Bermuda-to-Halifax run. Lieutenant Valcour boards the ship with the news that one of the passengers is a murderer. One of the victims is dead of strangulation, the other is in a New York City hospital; police are hoping this victim will recover to give a description of the killer. The murderer sabotages radio communication so police can not send the description of the guilty party, but Valcour has clues that indicate the murderer is aboard the Eastern Bay and he starts his investigation on his own among the bizarre menage of passengers. As the degrees of latitude sail by, the murderer strikes again, leaving such cryptic clues as a lump of wax, a stolen thimble, and a pair of scissors. Valcour achieves some impressive feats of detection to tie the clues to the culprit in classic fashion. Another recommended Valcour sea mystery is the fine Murder on the Yacht (1932). Valcour made an impressive debut with Murder by the Clock (1929) and went on to detective fame in a half-dozen novels, concluding with Murder Masks Miami (1939). Notable among King’s nonseries novels are A Variety of Weapons (1943), The Case of the Dowager’s Etchings (1944), and Museum Piece No. 13 (1946). Valcour may be in the second rank of great detectives of the era, but by no means does that mean readers who like a classical detective story well done should skip him. Plus, if King wasn’t always the most felicitous man with a phrase, he did manage some real suspense and mystery in interesting settings, plus genuine clues and detection.